Warmth: The warmth of the water can increase muscle relaxation, relieve joint stiffness, reduce muscle spasms and increase circulation. Buoyancy: The buoyancy of water counters the effect of gravity, allowing a graded return to the amount of weight bearing placed on muscles and joints following injury/surgery/illness. The gentle resistance of water can improve muscle strength, tone and endurance, as well as balance and core strength. Hydrostatic pressure: The increase in pressure against the fluid in the body can reduce swelling around joints and in the lower limbs. 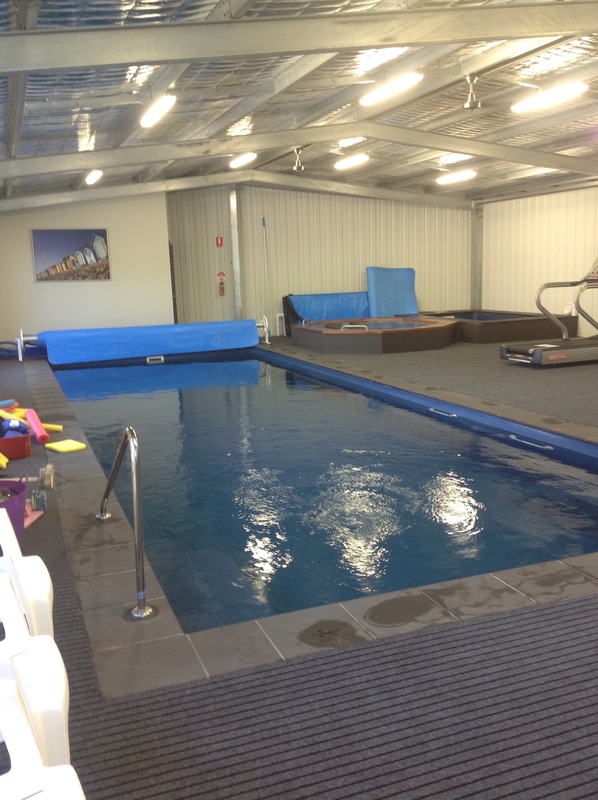 Our facility also has a large spa heated to approximately 38 degrees; a cold pool cooled to 12 degrees; and a sauna. Our state-of the art facility includes a spa (38 degrees), cold pool (12 degrees), and a sauna. These facilities can be used to perform “contrast therapy” – the process of cycling between warm and cold water immersion. Contrast therapy increases the efficiency of the body’s natural recovery processes, helping to remove the by-products produced by high intensity exercise. Many elite sporting groups use contrast therapy to recover from the rigorous demands of their sport due to these benefits. Our facility has a large gym space with a range of equipment. Our clients can use this equipment for both rehabilitation, and for strength and conditioning programs. This allows us to provide a full recovery from injury/illness, with our staff able to rehabilitate, recover and then re-strengthen you to reduce the risk of re-aggravation or re-occurrence. The heated hydrotherapy pool, spa, and sauna can promote relaxation by heating the body’s tissues, enhancing circulation and improving the mobility of muscles and joints. Enhancing circulation can improve function, by increasing the delivery of nutrients to all the systems of the body. Completing gentle, water-based exercise in our warm pools can also lead to the release of endorphin’s, the relaxing hormones of the body. The general buoyancy and subtle movement of the water in our pools can help you experience this calming effect. And surprisingly, if you’re game, a short dip in our cold pool can also have a rejuvenating effects to those feeling stressed and run down, ultimately leading to relaxation.